This project you find at github is a demonstration for the usage of the business rules engine json-rules-engine-simplified inside a SAPUI5 application. A rules engine allows business users to define logic in a simple way. This logic otherwise would have to be implemented by a programmer. Often there are at least two programmers or one programmer with two skills necessary. The backend logic (rules) would hold the logic in database tables (or other storage solutions) and the frontend would retrieve this logic from the backend and implement it at frontend side. With a business rules engine like json-rules-engine-simplified the business users can define their business rules in an administration view at the frontend. These rules will then be applied to the frontend at runtine of the application. Now as the endusers can define their own business rules I’m superfluous in my project ;-). For the sake of simplicity this demo application implements neither of the above mentioned use cases. It implements the business rule “Are you allowed to drink beer in country …?”. The regulations for drinking beer in general public are different from country to country. in the United States you have to be 21 years old. Find a running version of the below described Demo application on Glitch. Imagine you wrote an application that shows the users if they are allowed to drink beer. So your application offers an input field in which the user can enter their age. If they are not allowed they get a message that is usual for the country they are requesting. message "Hey, are you insane? You have to be 21 years old"
message "Soon you will be 16 years old and then you are allowed to drink beer"
condition and your application did it’s job. After some time your app produced interest. Users use it to know if they are allowed to drink beer in countries they plan to travel to. But your users not only want to see the regulation for these two countries and they are not happy with your messages they get shown. Different users want to see if they are allowed to drink beer for different countries and they want to see a nice and different message for each country. Cause you are a real business guy the $-notes blinked in your eyes. Unfortunately you aren’t aware of all regulations world-wide nor do you want to implement a complicated logic for saving and retrieving the user and language specific messages. That’s when business rules came on your mind. Let the user create rules for the countries she want’s to see in her list. A rule defines from which age you are allowed to drink beer resp. if you are too young. If the rule “You are too young” applies it returns a message. The user can create new countries in her list and alter the regualtions and the returned message in a way that does not need programing skills. Wow! Exactly what you were looking for. The developed application looks like this. At the top you see an input field in which the user enters her age. Beneath this field there is a TabContainer with one item for each language. If the user clicks at an items text (e.g. US or GER) the below section of the screen changes. In the top area the results of the rule evaluation are displayed, means you see a green check if the ruleAllowed fulfills and the ruleProhibited didn’t succeed. If the ruleProhibited succeeded and ruleAllowed didn’t you see a red cross and the message that is defined in the rules event->params->value. With the Plus the user can add a new country that has default rules as long as you do not alter them. 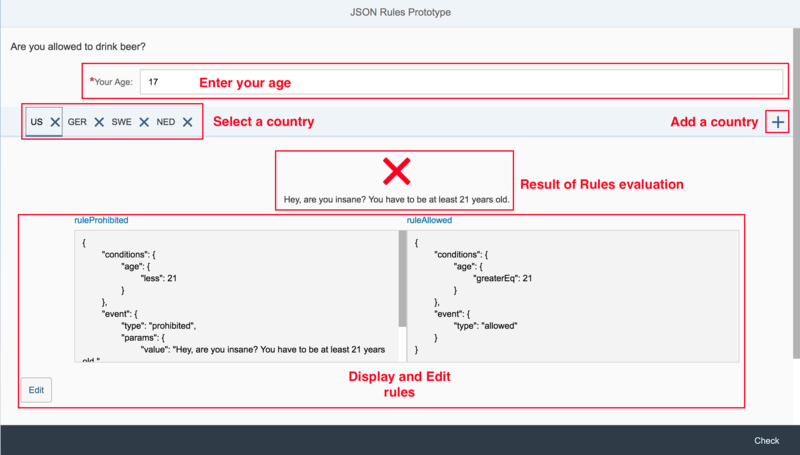 You can edit the rules for the selected country by clicking the Edit button and changing the rules text (JSON). A rule has a condition and an event part. The condition part describes which condition has to be fullfilled to raise the event of the event part. The event part defines a type and optionally params. When running the rules engine in your code the events for the fulfilled rules are fired. You can write handlers that react on those. to realize the use cases I mentioned at the top of this article. See the json-rules-engine-simplified github repository for much more possibilties to define rules. To fulfill the requirements I’m using the json-rules-engine-simplified rules engine that is written for node.js and available on npmjs.org. node.js modules can’t be used directly in browsers cause the node.js module loading mechanism is not implemented by browsers. Therefore I decided to use Browserify to convert the module with all it’s dependencies into a file that can be loaded by browsers. The rules engine was developed with ES6. Cause this is not supported by all browsers (I needed to support IE 11) I had to transpile the ES6 code to ES5 code. Hence I used Babel to get the code that can be run by IE 11. The result of the browserifying and babelifying tasks is the file webapp/js/json-rules-engine-simplified.js. This file not only contains the Rules Engine artifact but also adds a method to the global window object that returns an Engine object (this is the way objects of browserified files can be used outside the file). To use the Rules Engine you have to create an instance of it and apply rules to it. After you created the rules engine and applied the rules you can run the engine. As you can see we have to pass a facts object to which the rules are applied. In our case this object has only one property age that gets it’s value from the input field in the UI. Of course you can imagine that you can feed the run method with much more complex objects like e.g. a contract, person object, equipment object, … that can then be used in the rules. You can install and run the application locally or in SAP Web IDE. The following chapters describe both ways. To install the application in SAP Web IDE just clone the git repository. Then you can run the application via the webapp/index.html file. Node.js with NPM have to be installed at your computer. Open http://localhost:8080 in your preferred browser. If you are a consultant/developer like me who tries to make life easier for application users you will say: “Nice, but telling an enduser that he has to define his rules in JSON is not very user friendly”. You are right. Hence we plan to create a SAPUI5 control or set of controls that enables the user to define the rules in a somehow graphical way.